In June, it was T’s birthday. He really wanted to visit Estelle the year before but it had closed for their revamping (only the new Estelle Bistro had opened at the time, but he didn’t want to go to that one) so we visited Saint Crispin instead, which Scott Pickett co-owns. Estelle has now become Estelle Bistro and Estelle by Scott Pickett and they are next door to one another. For T’s birthday, I took us all (with his parents) to ESP (finally)! For the record, we had wanted to go to the original Estelle so badly and were basically fans of Scott Pickett before even tasting his food (purely based on his menus reading like a charm), and definitely before he became something of a TV celebrity. Dining at ESP involves a 7-course chef’s tasting menu. There will be extras you can add on throughout the courses – on our night there was the choice of an additional main and a dessert. 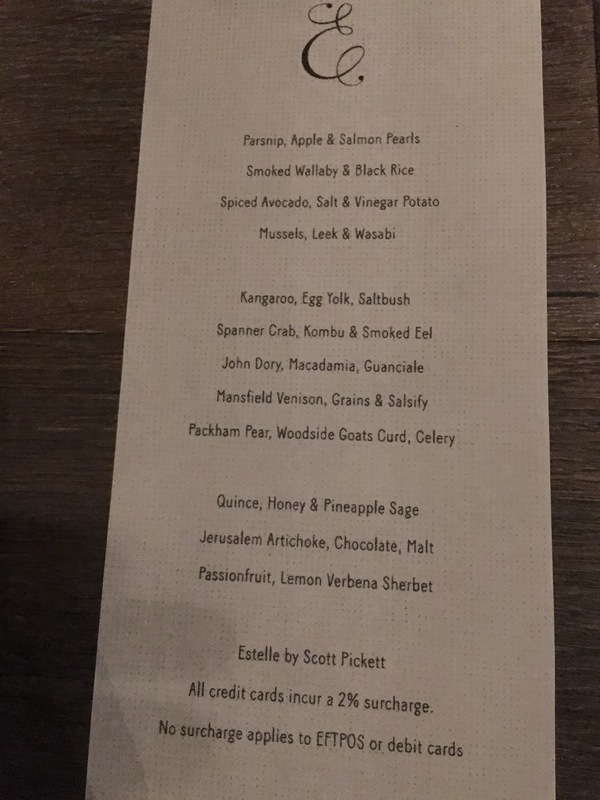 I expect Scott makes some changes to the menu quite constantly to keep it seasonal. We tried a debut dish that night! Writing a review felt so daunting and now almost two months later, I’m making myself just write up a casual post. Since it’s been so long I’m also struggling to remember details… whoops. Please excuse the dim lighting and iPhone photos. House-made onion and bacon bread & house-made pretzel (with house-churned butter). We could choose one or both. I should have taken both, as they were sooo yummy, but shared half and half with T because I wanted to save room for the food. The butter was super luxurious. Parsnip, Apple & Salmon Pearls; Spice Avocado, Salt & Vinegar Potato (really creative and tasty); Mussels, Leak & Wasabi. Also, we did actually ask the wait staff to confirm what was edible and what wasn’t – everything that you wouldn’t expect to eat is not edible, haha. Smoked Wallaby & Black Rice. I’ve never tasted wallaby before! Kangaroo, Egg Yolk, Saltbush. This was actually a really delicate consome and had amazing depth of flavour. T’s mum also found the wallaby and kangaroo lovely despite initial apprehension. Spanner Crab, Kombu & Smoked Eel. Featured in June’s Food Lately post, this was maybe my favourite dish of the evening. I love crab, and this had an amazing combination of flavours. John Dory, Macadamia, Guanciale. This dish was a bit salty for my liking. At this point, Scott Pickett himself came to deliver the next dish, on its debut night: Mansfield Venison, Grains & Salsify. We were rather excited and had a quick chat with him… then we tucked in and NOBODY managed to get any photos! Haha. Unfortunately I wasn’t keen on the meat, which I found a bit tough and chewy for my liking. We all skipped on the additional main course which was a duck. Packham Pear, Woodside Goats Curd, Celery. Palate cleanser before desserts. Quince, Honey & Pineapple Sage. Jerusalem Artichoke, Chocolate, Malt. Yes, artichoke! Who would have thought! We weren’t tempted by the duck, but we were tempted by the banoffee toffee souffle with salted caramel ice cream! I was a definite yes. We ended up getting just the one to share since it was a pretty decent serving. Watching the wait staff drop the scoop of ice cream in the tall souffle was mesmorising. Speaking of the staff, they were all so amazing. They were friendly and very down-to-earth despite the high-end atmosphere. They were attentive and very detail-driven. A chair appeared for me while I struggled to crouch slightly for photos. The bill came when I glanced and made eye contact with a staff member. It was the little things that really made a difference. Passionfruit, Lemon Verbena Sorbet. A to-die-for delicious end to the food. At the end of the night, Scott Pickett even came out to take photos with us and ask us what we thought of everything and what our favourite dishes were. He’s such a friendly character and incredibly passionate about food. I really appreciate that despite being relatively famous, he appears to come in most days to the kitchen. Just like in our experience, many other reviews mention him chatting with diners and getting feedback from them. These days top chefs aren’t very hands on when it comes to the day-to-day running of their flagship restaurants and their presence isn’t really felt, which is why I’m not really a fan of the big and popular restaurant giants. I can really feel Scott’s dedication to ESP and how much it means having his name on the restaurant. I think it makes a huge difference, his presence in his own restaurant. We had a really wonderful evening, thanks to his lovely food but also the friendly and relaxing atmosphere provided by all the staff. At one point we were taking photos of the gorgeous (and huge) open kitchen, and his head chef posed for our photos. To be honest, our chef’s menu at ESP was heads and shoulders more creative, unique and intricate than at Saint Crispin, where we also had a 7-course degustation (and only cost marginally less). I was not overly full from ESP, but left so much happier than when I left really really full from Saint Crispin (having let T finish a lot of my food too). I think there’s no comparison between the two ventures. Scott Pickett’s flagship restaurant is the way to go. I would definitely return to ESP for a future special occasion.